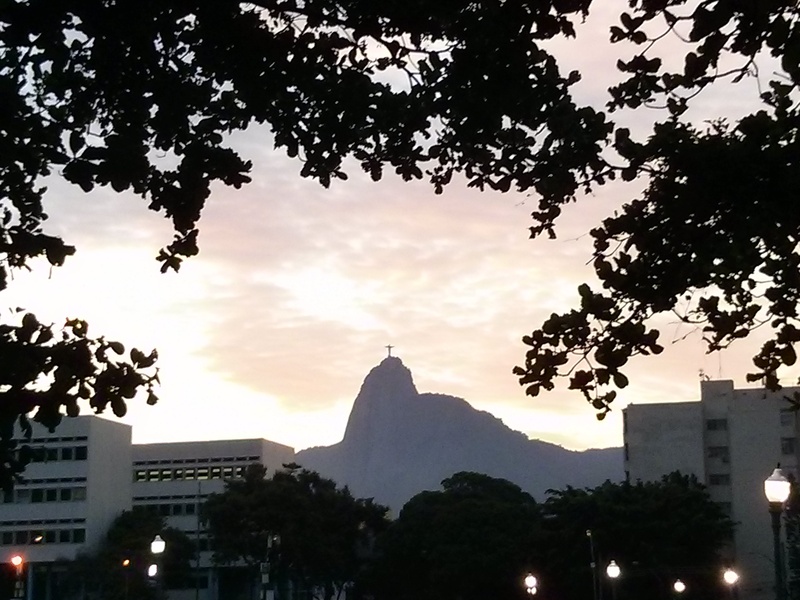 A view of Christ the Redeemer from the parking lot of the Sugarloaf cable car ticket office. We had some aipim frito at the nearby restaurant. 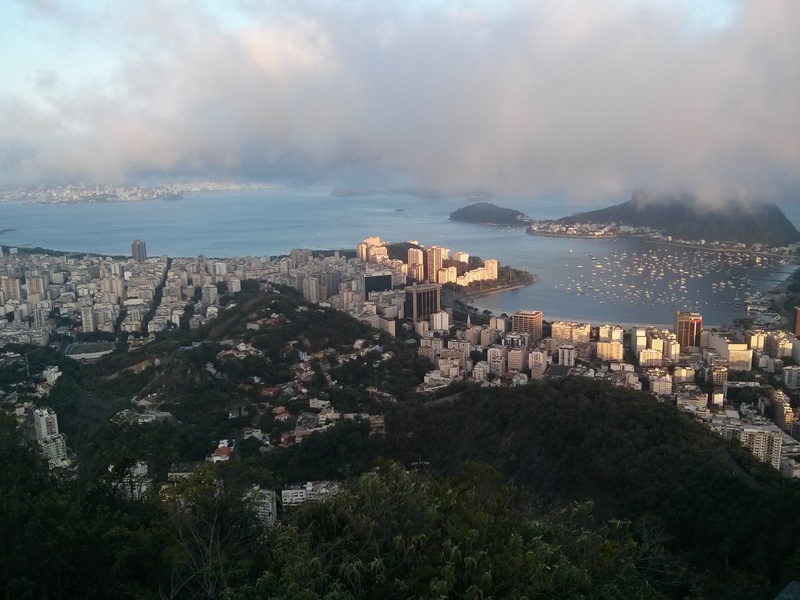 I spent two weeks in Rio de Janeiro over Christmas and New Year’s. We stayed with family, so I was lucky to eat many authentic meals at home. We also went out to experience some of the treats Brazil has to offer. In this part, I’ll cover what to eat in gluten free Rio de Janeiro! Earlier this week I covered where we went and what we did for fun. 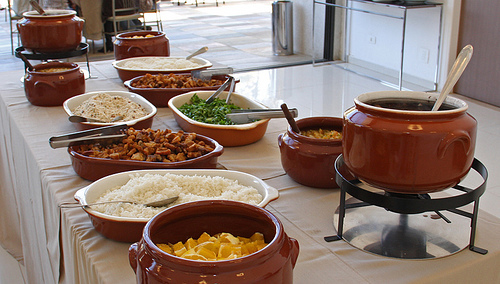 Feijoada – It’s the national dish of Brazil. It’s a stew made from pork, beef and black beans all slowly cooked together. I learned from friends that you should eat it with white rice, sautéed collard greens, diced oranges and farofa, toasted tapioca flour. Carne de Sol – Translated, this is “meat of the sun.” It’s actually made in a process similar to how beef jerky is made. The end result is beef with a salty, hard exterior and a moist and tender interior. Give it a try! Churrasco – Brazil is famous for its barbecued meats. You’ll find meat on offer everywhere from beachside kiosks to sit down, rodízio-style restaurants where the meat is delivered right to your table on giant skewers. This is an experience worth having at least once on your trip! Aipim – It’s a root vegetable, also known as cassava, manioc, and yucca, depending where you ask. It’s often served fried, shaped like chunky french fries or in little bites, and best dunked in melted butter. Pão de queijo – these cheese bread rolls are everywhere. Small and round, they are crispy on the outside, but soft and airy on the inside. They are made from tapioca flour and are naturally gluten free. They make a great snack or breakfast on the go. 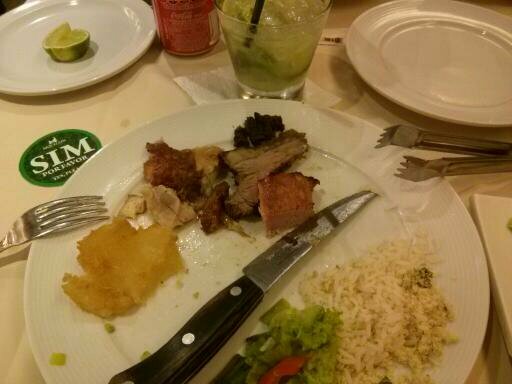 My caipirinha is just behind the carnage from our churrascaria visit! Caipirinha – This cocktail is made from cachaça, a Brazilian liquor made from sugar cane. It’s somewhat similar to rum, but there are differences. The cocktail is made by muddling lime and sugar, then adding the cachaça and ice. They are delightful and refreshing after a long day in the sun. Fruit juices – You’ll find freshly squeezed juices are very common in Brazil. You may not recognize all the fruits, but give them a try anyway! Açaí – this little fruit is often touted as a superfood because of its antioxidant qualities. You’ll find it most commonly served blended into a cold, creamy treat – a really thick smoothie that you eat with a spoon. Brigadeiro – A delicious chocolate bon bon famous in Brazil. Jamie Oliver might not be a fan, but don’t let that sway you. These are simple, soft chocolates that are usually rolled in sprinkles or chopped nuts, and they are delightful. These are typically gluten free, just pay attention to what they’ve been rolled in, as sprinkles can be trouble. Tapioca cous cous (also called cuscuz Branco) – Don’t worry, it’s not really cous cous! This gluten free treat is actually made from tapioca and coconut, and it is a delicious, dense cake-like dessert served cold. Here’s one I don’t recommend you do! On Christmas night, we went out for dinner. I felt off later that night and woke up incredibly ill early the next morning. I spent the entire day between bed and the bathroom, and in the evening I found out I had a 102F fever (38.9C). My partner and his mom were ready to haul me to the hospital, but I convinced them to let me take Ibuprofen to see if I could reduce the fever. Thankfully it worked and I didn’t have to visit the hospital in a foreign country where I don’t speak the language. By the next morning, I was able to hold a little food down, and I was back out (on a restricted diet) the day after that. Pro tip: As soon as I could hold anything down, my partner’s mom handed me *saccharomyces boulardii , which is often used to treat diarrhea. I think this is why I was able to recover so quickly despite being so incredibly ill. Carry this when you travel so that if you do get food poisoning, you can minimize the interruption to your trip! You can also find it in pharmacies in Brazil – one brand I remember seeing there was *Florastor . I had to make a quick recovery from the food poisoning so I could go see this amazing view! To be honest, I did everything I was supposed to. I only drank bottled water (or filtered at home). I ate in restaurants that were popular and established and was careful about eating street food. I even had a translator to make sure I didn’t eat gluten! My guess, based on the fact that it was Christmas night, is that they had poorly trained kitchen staff on duty. (The front of house service was much the same.) I either ate something bad, or the ice in my drink was made from icky water. So, be careful about what you eat and drink, as you would in any country with pollution problems. All in all, eating gluten free in Brazil was pretty easy. Lots of the foods there are naturally gluten free anyway, with beans, rice, meats, and tapioca common base ingredients for meals. Have you been to Brazil? How about a Brazilian barbecue restaurant? What’s your favorite Brazilian food? *Products featured in this article are linked via the Amazon Associates program. I receive a small percentage of purchase totals when things are bought via these links, which helps offset web hosting fees. It costs you nothing! If you’re going to buy these or other items via Amazon, please consider clicking through one of my product links before making your purchase. Thank you! It’s so tricky sticking to a certain diet while on holiday. I’m sorry to hear you got sick though, I’d want to avoid going to a hospital abroad too.